The Berkshire Hathaway 2017 Annual Report has just been released (download from here). 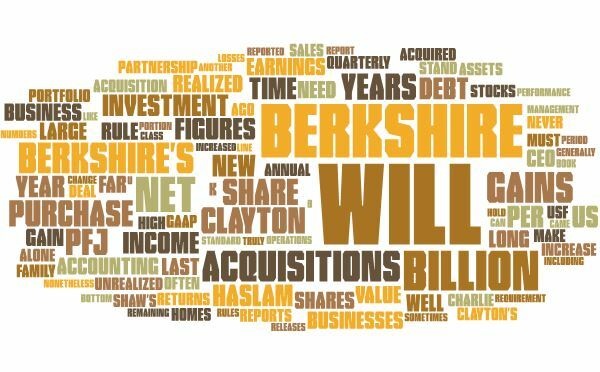 Below is a word cloud generated from the Chairman’s (Warren Buffett) Letter to the shareholders in the report. This coming Friday, 16 February 2018, will be the start of the Chinese New Year. The following chart plots the average performance of the S&P 500 Index for each animal year since 1950. For example, Ox years started in 1961, 1973, 1985, 1997, 2009; and the average performance of the market in those (Chinese) years was +14.0%. The Chinese New Year starting this Saturday will be the Year of the dog! 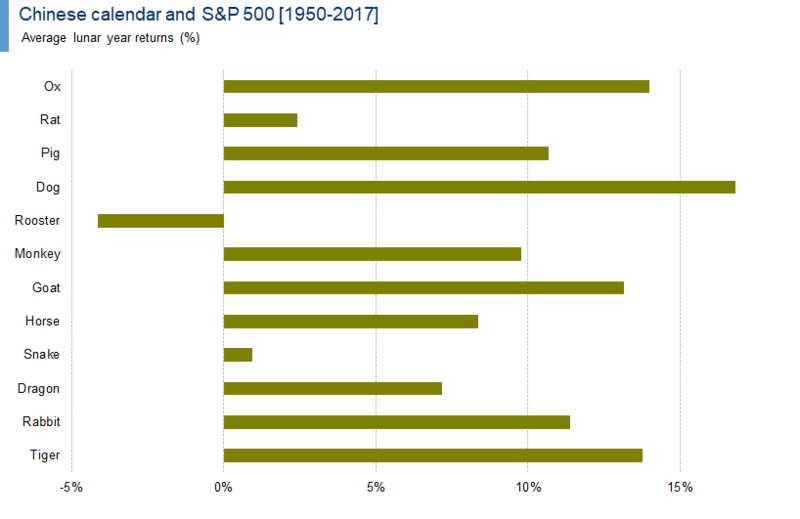 This is very good news for investors, as since 1950 dog years have the strongest average returns of the S&P 500 Index of any of the Chinese zodiac animals. Over the last 50 or so years the average lunar year return for dog years has been an impressive 16.8%. Further articles about the Chinese New Year. 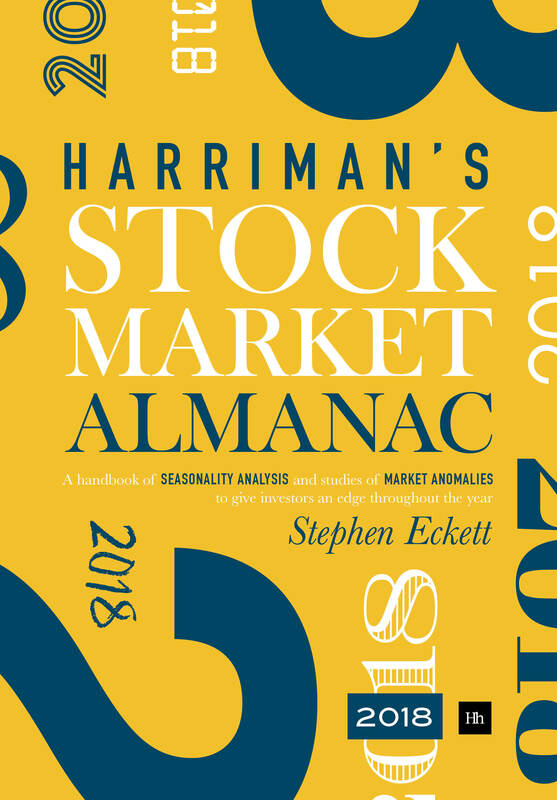 The above and other significant trading dates can be seen in the online Almanac Diary and can be added to your own online calendar. How do investors measure unrealised losses? One way is to compare the current price with the price paid for an investment. So, for example, if you pay 100 for an investment and its current market price is 90, then you are sitting on a (unrealised) loss of 10%. This 25% loss is referred to as the drawdown, which is defined as the percentage loss from a previous peak. The concept is common in trading but can also be useful for investors to understand. The following table shows the drawdowns for the FTSE All-Share Index for the period 1969-2017. 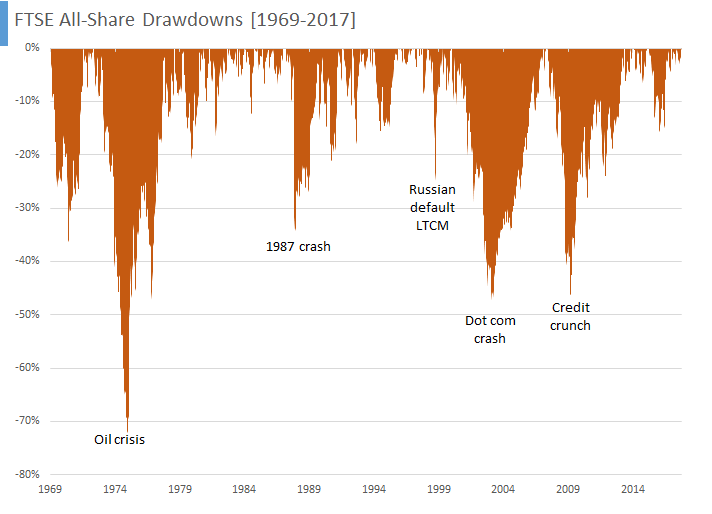 The first thing to notice about the chart is that there are an awful lot of drawdowns! In fact, because the market doesn’t make new highs every day it is usually in a drawdown state. And this can have a psychological effect on investors. This is a Good Thing – stocks go up in the long-term! However, that chart does not necessarily reflect the actual experience of being invested in the market over this period. For this, the drawdown chart above may more accurately represent the feelings of investors. This is because investors’ portfolios are underwater for most of the time, i.e. the portfolio value is below its peak value (which will most likely be a recent strong memory for the investor). The table below breaks down how long the market spends at various drawdown levels. For example, for 16% of the time from 1969 the market had a drawdown of 5%-10%, and it was in a drawdown state of over 20% for 27% of the time. And, while a drawdown of just up to 5% may not seem very much, in practice it is 32% of the time that investors are likely to be feeling slightly disgruntled having “lost” money. So, while the data shows us that stock markets increase over the long-term, the direct personal experience of investing may be for investors largely that of a prevailing sense of loss. This sense of loss is something that investors have to learn to live with. A previous post listed some of the strategies included in the 2018 edition of the Almanac, listed below is some of the additional updated analysis included in next year’s edition. 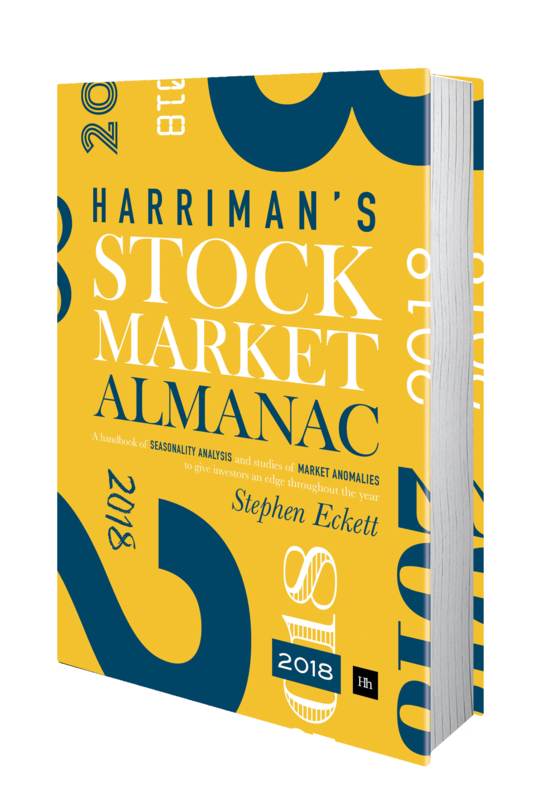 Order your copy of the 2018 edition of the Almanac now! Bounceback Portfolio – a strategy that buys the worst performing shares in a year, and then sells them after three months into the new year; the strategy has out-performed the Index in 13 of the last 15 years. Construction Sector 4M Strategy - exploits a seasonality anomaly of the construction sector that greatly out-performs the FTSE 100 Index. Sell in May – this extraordinary effect remains as strong as ever: since 1982 the market in the winter months has out-performed the market in the summer months by an average 8.2 percentage points annually. Sell In May Sector Strategy - how to exploit the Sell in May effect with sectors. Summer Share Portfolio - a portfolio of seven stocks that has out-performed the market in nine of the last ten years. Sell Rosh Hashanah, Buy Yom Kippur – the US equity market tends to be weak between these two Jewish holidays; is there a similar effect in the UK market? Santa Rally - does a Santa Rally exist for shares and, if so, when does it start? Day of the Week Strategy – a strategy exploiting the day of the week anomaly that out-performs the FTSE 100 Index. Tuesday Reverse Monday - do market returns on Tuesdays reverse those on Monday? Turn of the Month Strategy - all the market’s gains occur in the six days around the turn of the month. FTSE 100/250 Monthly Switching Strategy – on the back of research into the comparative monthly performance of the two indices, a strategy of switching between the two markets is found that greatly out-performs either index individually. FTSE 100/S&P 500 Switching Strategy – the strong/weak months for the FTSE 100 Index relative to the S&P 500 Index are identified; and a strategy of switching between the two markets is found that produces twice the returns than either market individually. Monthly Share Momentum Strategy – a monthly re-balanced momentum portfolio of FTSE 100 stocks beats the market. Quarterly Sector Strategy – The strongest/weakest sectors for each quarter are identified; and the Quarterly Sector Strategy continues to beat the market. Is this strategy even easier than the World’s Simplest Trading System mentioned below? Quarterly Sector Momentum Strategy – a portfolio comprising the best FTSE 350 sector from the previous quarter, and re-balanced quarterly, out-performs the FTSE All Share Index by an average of 2.0 percentage points per month. A variant – buying the worst sector of the previous quarter – has performed even better. Low/high Share Price Strategy – a portfolio of the 20 lowest priced shares in the market has out-performed a portfolio of the 20 highest priced shares by an average 39 percentage points each year since 2002. World’s Simplest Trading System - a simple trading system based on moving averages with an impressive performance. 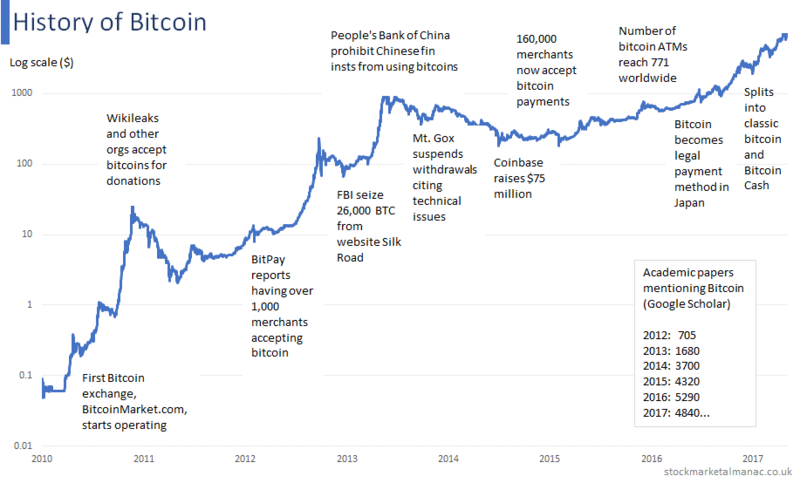 The chart below plots the price of Bitcoin from July 2010 to November 2017. The price on the Y-axis is plotted on a logrithmic scale (as the price has grown exponentially).